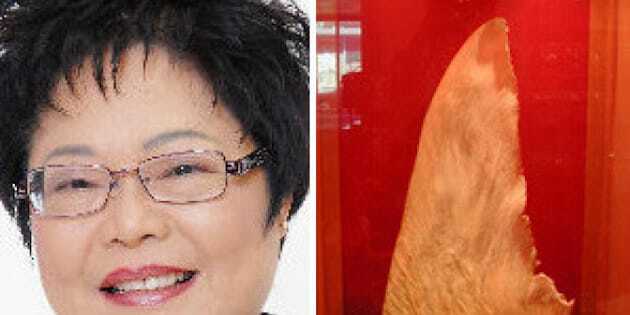 Eating sharks from "legal" fisheries is OK, said Richmond MP Alice Wong in statement Wednesday, almost two weeks after enjoying a bowl of shark fin soup in front of a select group of Chinese-language media. "I am of the view that shark which comes from a legal, humane and sustainable fishery is no different from any other food that Canadians may or may not choose to consume," Wong said. The shark fin soup debate heated up this month after Wong held a news conference in her home riding on Oct. 11 for Asian media only. The event was held at Jade Restaurant, which is owned by an outspoken opponent of shark fin bans. It's unclear if the shark eaten by Wong was sourced from a legal fishery. Anthony Marr of the Vancouver Animal Defense Legaue told The Richmond Review that there was a "high probability" Wong's shark fin came from an endangered animal. Other federal MPs, including B.C. NDP MP Fin Donnelly, have been vocal about banning shark fin. The movement to ban shark fin is aimed at ending shark finning -- the illegal practice of cutting off the animal's fin and throwing the shark back into the ocean to die -- around the world. Shark fins can fetch up to $650 USD per kilogram and a single bowl of soup can range from $5 to $2,000 per bowl, according to non-profit shark conservation group Shark Truth. It's a popular status item served at Chinese banquets. An estimated 73 million sharks are killed each year for shark fin soup, said the group.